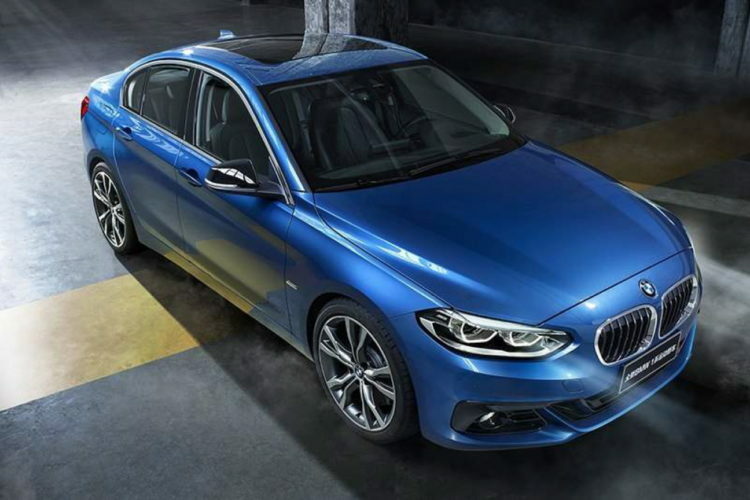 BMW introduces the all-new BMW 1 Series Sedan last November at the Auto Guangzhou 2016. Although only of the Chinese market, the 1 Series sedan should help BMW in the segment currently dominated by the Audi A3 and Mercedes-Benz CLA Class. The 1 Series sedan measures 4,456 mm in length, 1,803 mm in width and 1,446 mm in height, and has a wheelbase of 2,670 mm.The proportions are similar to a compact/medium size sedan. It’s proportioned well, handsome and sporty looking, even with its front-wheel drive layout. The all-new BMW 1 Series Sedan inherits the same classic design identical to the BMW family, such as the double kidney grille, double round headlights, long bonnet, short overhangs, “Hofmeister-Knick” design, and enhanced shoulder lines on the side. The 1 Series Sedan features a floating dashboard that has a center console angled towards the driver. It also features a three-spoke multi-function steering wheel, Start & Stop button, electric brake, full color Head-Up Display, 8.8-inch LED central screen, and BMW iDrive system. Passengers in the front and back can sit comfortably, and the rear seats at the back can be folded in 40:20:40 to provide extra roominess. 0.7m² panoramic roof, the biggest of its class gives a delightful atmosphere, and the highly-efficient air filter inside the car offers filtrated fresh air for all passengers. At launch, the BMW 1 Series Sedan will be available in three petrol variants: 118i, 120i and 125i. The base 118i is powered by a 136 hp 1.5-litre TwinPower turbo three-cylinder engine paired with a 6-speed automatic gearbox, while the 192 hp 120i and 231 hp 125i will pack a 2.0L TwinPower four-cylinder engine mated to an 8-speed automatic gearbox. The video below takes us around and inside the 1 Series Sedan.